Hope you're all enjoying the last remnants of our beautiful Canada Day long weekend. 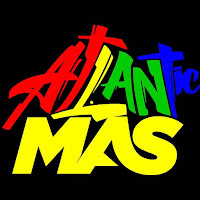 Did you spend anytime this weekend getting ready for Toronto Carnival.....the countdown is on yuh know!!! So news today is about the new parade route.....check it out below. What do you think? 10:00 a.m. and ends at 6:00 p.m. inside Exhibition Place. The Orange zones are for paying spectators and the admission fee is $15.00. The circled E denotes the entrances to paid areas. 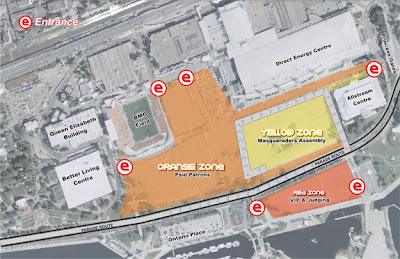 The Red zone indicates the Judging area, which is on the South side of Lakeshore Blvd, and the VIP area, which is in the Easterly parking lot of Ontario Place. Paid VIP seating admission is $50.00. The Grey area indicates the Parade Route which starts inside Exhibition Place and makes a loop to proceed in front of the Direct Energy Centre, turning right to go south on Newfoundland Dr.and right again to go West along the Lakeshore. The orange viewing area just south of the masqueraders assembly point will afford spectators an unobstructed view of the bands as they parade in front of the judges. This part of the grounds is sloped towards the Lakeshore and affords family a splendid picnic and viewing opportunity. Paying patrons may enter from Princess Gate, Ontario Drive and Princess Blvd. Nova Scotia Dr, Nunavut Road, the East Bridge between Ontario Place and Exhibition Place, and the South-eastern end of the easterly parking lot in Ontario Place.